Over the course of many decades, the city of Shreveport witnessed dramatic growth and ever-changing landscapes. Mule-drawn railways gave way to electric streetcars, and what was once the Confederate capital of the state became today's vibrant commercial hub of northwest Louisiana. 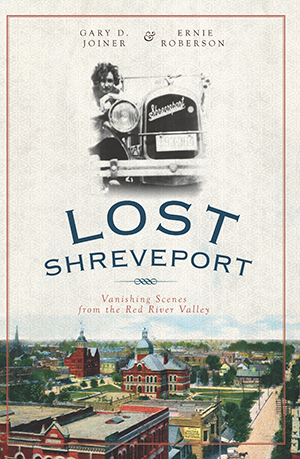 Drawing from their extensive image collection, authors Joiner and Roberson depict the disappearing scenes and lost stories that form the complex layers of Shreveport history. From the famous performances of Pawnee Bill's Wild West Show to the infamous red-light district, from the decline of vigilante justice to the victims who perished from yellow fever, Joiner and Roberson recover and remember lost Shreveport. Gary Joiner is a history professor at LSU–Shreveport, director of the Red River Regional Studies Center and has written many articles and books on the history of the Red River Valley region of northwestern Louisiana. Since 2006, he has aired a weekly radio program called History Matters for Red River Radio and is an experienced and popular lecturer on history, geography and archaeology. His myriad affiliations include the Civil War Preservation Trust, U.S.; the North Louisiana Historical Association (former board of directors, former editor of North Louisiana History); the DeSoto Parish Historical Society (former president); the Southern Historical Association; the Louisiana Historical Association; the Oakland Cemetery Preservation Society; the Spring Street Historical Museum; Red River Radio; the Red River Heritage Association; the Sons and Daughters of Pioneer River Men; and the Historic Shreveport Preservation Society. Ernie Roberson is a graduate of Louisiana Tech University. He has served as the Caddo Parish registrar of voters since 1990. Prior to that, he served as an aide to two U.S. congressmen. He is a former member of the Caddo Parish Police Jury (county commission). He is the author of several auto racing articles on IMCA legends and the Louisiana State Fair Speedway in Shreveport.